Samhain is one of the eight festivals of the Wiccan/Pagan Wheel of the Years that is celebrated as the new year with the final harvest of the season. It is considered by most practitioners of the craft to be the most important of the eight Sabats and one of the four fire festivals, Imbolc, Beltane and Lughnasadh. Beginning at sundown on October 31 and continuing through the next day, fires are lit and kept burning to recognize the shortening of days and the coming of winter’s long cold nights. Many of the traditions practiced in the US have come from Ireland, Scotland and Whales. The carving of gourds and pumpkins used as lanterns, the wearing of costumes and masks, dancing, poetry and songs, as well as some traditional foods and games can be traced back to medieval times and pre-Christian times. Two Roman festivals became incorporated with Samhain – ‘Feralia’, when the Romans commemorated the passing of the dead, and ‘Pomona’, when the Roman goddess of fruit and trees was honoured. The Halloween tradition of bobbing for apples is thought to derive from the ancient links with the Roman fruit goddess, Pomona, and a Druidical rite associated with water. It is also the time of the year that we reflect and honor our ancestors and especially those who have departed since last Samhain. According to Celtic lore, Samhain is a time when the boundaries between the world of the living and the world of the dead become thinner, allowing spirits and other supernatural entities to pass between the worlds to socialize with humans. The fires and the candles burning in western windows are believed to help guide the spirits of the departed to the Summerlands. Like all Wiccan festivals, Samhain celebrates Nature’s cycle of death and renewal, a time when the Celts acknowledged the beginning and ending of all things in life and nature. Samhain marked the end of harvest and the beginning of the New Celtic Year. The first month of the Celtic year was Samonios – ‘Seed Fall’. The Catholic church attempted to replace the Pagan festival with All Saints’ or All Hallows’ day, followed by All Souls’ Day, on November 2nd. The eve became known as: All Saints’ Eve, All Hallows’ Eve, or Hallowe’en. All Saints’ Day is said to be the day when souls walked the Earth. In early Christian tradition souls were released from purgatory on All Hallow’s Eve for 48 hours. We decorate our homes with candles, gourds and dried leaves. Meals are traditionally lots of veggies, fruit, nuts and breads served with wine, cider and hearty beer. We make a hearty stew that is served with a whole grained bread and deserts made with apples, carrots and pumpkin. One of the sweet breads that is traditionally served is barmbrack, an old Irish tradition. The bread is baked with various objects and was used as a sort of fortune-telling game. In the barmbrack were: a pea, a stick, a piece of cloth, a small coin (originally a silver sixpence) and a ring. Each item, when received in the slice, was supposed to carry a meaning to the person concerned: the pea, the person would not marry that year; the stick, “to beat one’s wife with”, would have an unhappy marriage or continually be in disputes; the cloth or rag, would have bad luck or be poor; the coin, would enjoy good fortune or be rich; and the ring, would be wed within the year. Today, the bread usually contains a ring and a coin. 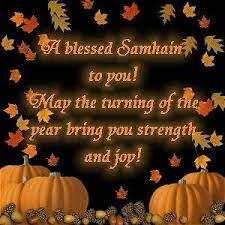 What ever you believe or not, Samhain has meaning for us all since the Wheel turns for all of us. So light a fire or a candle and dance with us as the Veil Thins. I heard a laugh a’laughing.